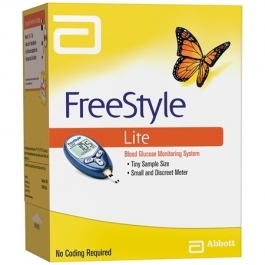 The FreeStyle Lite blood glucose monitor is designed specifically for people who value convenience and discretion when it comes to testing. The FreeStyle Lite meter requires a tiny blood sample, to make testing not only discreet, but Virtually Pain-Free. Plus, programmable alarms and several potential testing sites facilitate timely, comfortable monitoring for better blood glucose control. The FreeStyle Lite system is designed for virtually pain-free testing in a discreet meter. Small meter for discreet testing. Test light and backlit display allow for glucose readings and results - even in low light. 4 programmable alarms remind patients when to test. 60-second sample reapplication time and fill-trigger designed to prevent test from starting without an adequate blood sample.